Dhaka, 12 Jan, Abnews: Visiting Tower Hamlets Council Speaker of London Sabina Akhtar yesterday highly praised Bangladesh's stunning development in different sectors, especially education and women empowerment, under the dynamic leadership of Prime Minister Sheikh Hasina. "I'm very much amazed to see the development activities in Bangladesh under your leadership," the Tower Hamlets speaker told Prime Minister Sheikh Hasina when she called on her at her Jatiya Sangsad office here yesterday evening. Councillor Sabina Akthar, the first-ever Bangladeshi woman speaker of Tower Hamlets Council, said she witnessed the proceedings of Bangladesh Parliament yesterday, saying that she is impressed with the performance of the prime minister in the House. The Tower Hamlets speaker informed Sheikh Hasina that nearly one lakh Bangladeshis are living in her area. "We're running a number of Bangladeshi schools in Tower Hamlets area," she said. 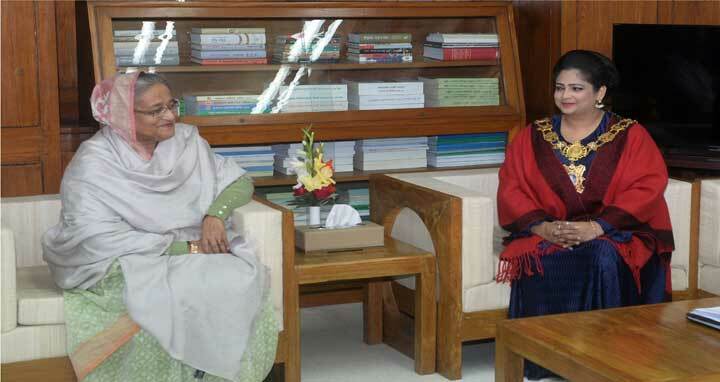 Sabina Akhtar said she is visiting Bangladesh to promote relations between the two countries. The premier congratulated Sabina Akhtar on her election as the first Bangladeshi-origin speaker of the Tower Hamlets in London. She also appreciated her contributions to the wellbeing of Bangladeshi community in London as a whole and in Tower Hamlets in particular. Pointing out her government's strides for development of the education sector, the premier said: "We're promoting education at all levels". The prime minister said her government is providing stipends to primary-level students by distributing the money among one crore 30 lakh mothers through mobile phones. She also said the local people have come forward to supplement the government's school-feeding programme. While elaborating her government's measures for tackling terrorism and militancy, Sheikh Hasina said her government has involved cross section of people including teachers, students, public representatives and religious leaders to create awareness against these social menaces. "We've received a positive response from the people in this regard," she said. PM's Principal Secretary Md Nojibur Rahman and Chairperson for Centre for NRB MS Shekil Chowdhury were present on the occasion.